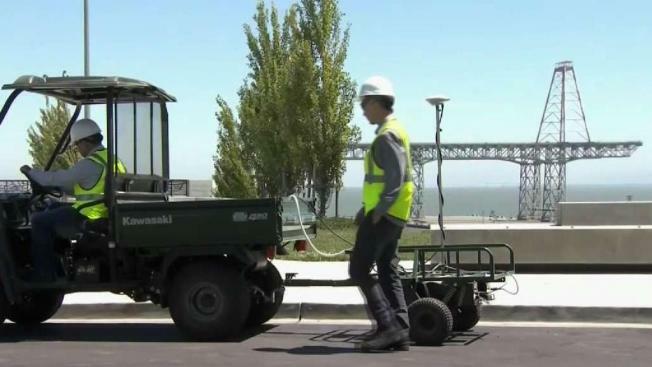 Officials from the California Department of Public Health last week found a small military object containing radium on an area of the Hunters Point Shipyard that’s close to homes. The unexpected finding at the San Francisco superfund site calls into question claims by state and federal officials for more than a decade that the residential portion of the shipyard is clean and was never contaminated with radiation to begin with. This photo was sent by the SF Shipyard team to homeowners at Hunter's Point. NBC Bay Area tweeted out the findings by the state health department on Thursday. In a progress update on the safety scanning survey the health department is performing on the area near homes – an area referred to as Parcel A – Mark Starr, Deputy Director for Environmental Health, said on September 7 workers found a naval deck marker 1.5 inches in diameter that contained radium. The object was located at the bottom of the hill on the north side of Parcel A, in an undeveloped area behind a fence, Starr wrote in his progress update. This map was sent by the SF Shipyard team to residents at Hunter's Point. Crews removed the deck marker. Tests found no elevated levels of radiation in the surrounding soil. Health officials maintain there is no public safety or health hazard. The health department has completed 70 percent of the scanning surveys on Parcel A, which began in July. The EPA first conducted radiation scans in 2002 when officials drove a scanner van over the area to test for radiation. The results “were found to be within levels attributable to naturally occurring sources,” according to Navy records. In 2012, federal officials conducted aerial scans using equipment that can detect radiological contamination. Soil samples were never taken at Parcel A. Read more about the Hunters Point cleanup on NBC Bay Area's Investigative Unit series page.